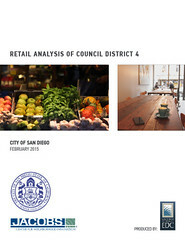 EDC, The Jacobs Center for Neighborhood Innovation and City Councilmember Myrtle Cole's Office released a study on Thursday that revealed City Council District 4 residents face more than $1 billion in unmet retail demand, presenting an opportunity for retailers and developers in the region. The study analyzed data from the Nielsen Group to find that District 4 residents spent more than $1.9 billion on retail purchases in 2014. All sales made within the district, however, totaled only $889.6 million in the same year. This represents an unmet demand of more than a billion dollars—an apparent opportunity for investors. "Imagine the possibilities. This could be Gaslamp East,” Councilwoman Myrtle Cole told the U-T and approximately 80 people who participated in a bus tour of the district. For more information about development opportunities in District 4 and the recent bus tour, please contact Councilmember Cole's office here.